Get the house functionality you need. The next step is to figure out what you need and want in terms of your living space. To a reasonable extent, your square footage is going to be limited by your budget. Obviously it costs more to build a larger house than a smaller house, but also your annual property taxes will go up with the square footage. If you have a large family, then you will need more space. If you don't have kids or your kids have grown up and flown the nest, then 2000 square feet may well be enough. Another factor to consider is whether a grandparent will be coming to live with you and you want to be able to give them their own space. Perhaps you want to have lots of guests coming to stay for weekends, or you want to be able to take in lodgers to help pay for the house. Ecological concerns might make you want to build a small house, although a big house that is well insulated is also eco friendly. Perhaps you want to build a big impressive house because you just fancy doing it. Before trying to do a floor plan, try drawing individual rooms in isolation on squared paper (1 foot to 1 square). A computer drawing package of course is a good alternative to squared paper, and makes it easy to change things, but an important point is to keep things really simple and free flowing at this stage, so use whatever you're comfortable with. 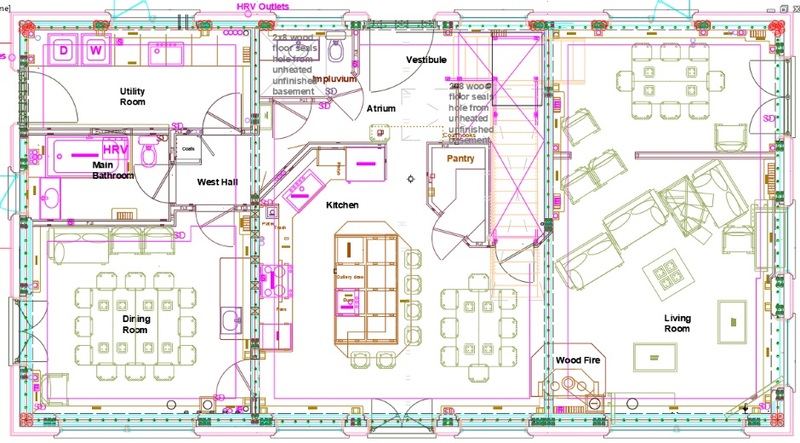 When it later comes to doing the proper floor plan you will need a PC drawing package and that is described in the floor plan step here. What size of living room / family room would you like? A large one will look impressive, but it may feel like being in a grand hall rather than a cozy living space. A large room may mean that your couches are too far away from the TV in the corner. Draw your furniture to scale on the room drawing. Measure distances in your current living room / family room and decide relative to that how much bigger you want to be. Think about what the seating arrangements were when other family members visited last Thanksgiving or Holidays. Draw out what you want in terms of a kitchen. Do you want a center island? How many sinks do you want? Do you want a walk-in pantry? Do you want 4 different types of garbage bins to handle the different types of recycling? List the other rooms you want and also draw them on squared paper in isolation. Do you want a study? Do you want a formal area to meet with visitors away from the mess that's in your family living room? I assume you want a utility room. What about a dining room or a media room? Try assembling your ideas on the different rooms into a main level floor plan. Don't worry about the bedroom level initially, but do remember to allow room for the stairs up to the bedroom level. If you want a basement then you'll want to allow room for some stairs from the basement (although you may be able to fit these under the stairs to the bedroom level). Here is my main level floor plan. Drawing the floor plan is covered in the house building step shown here, so for the moment I'm just talking about the general principle of floor plan design. It will take many incremental changes to get to your perfect floor plan. This is normal, so try not to be discouraged. If you can, try hard to fit everything into a simple rectangle rather than putting bulges in the walls, because a rectangle is the most efficient on building costs and heating costs. Obviously feel free to deviate from a rectangle for some architectural feature you really want such as porticos. Once you are reasonably happy with the main level floor plan and have allocated a position for the stairs, take a shot at the bedroom level.